Clipper seam is the most common type of seam on filter fabrics, covered by a layer of an adhesive to protect it from damage done by the scraper or sludge distributors during belt operation. Hooks of the seam are made of AISI 316L stainless steel. Pin seam is made of PET yarns. It is very flexible and protects the seam from premature failure in case of fabric distortion. Woven seam is the type of seam with the highest tensile strength and the longest service life, similar to those of the fabric. 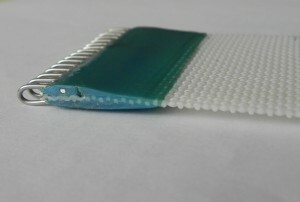 Woven seam is used only on endless belts.